As an OB/GYN, hormone expert, and specialist in women’s health, I receive a lot of questions from my patients about their bodies. While many of the questions involve hormones and reproductive health, I am also asked a lot about physical activity. Specifically, which exercise is the best for weight loss? How do I build strength without bulking up? Is CrossFit too dangerous for a woman my age? And what the heck is all this buzz about barre fitness? Many women remain confused about which exercise is best for them. While there is no single or “correct” answer, I have a few strong opinions about which exercise is most likely to reduce inflammation, least likely to cause injury, and overall, get you lean. Since it’s close to impossible to prescribe a “one size fits all” approach, I started thinking: how could I best give safe and appropriate guidance for a wide range of female fitness needs? It is with this question in mind that I came up with the idea of providing a grading scale (more of a review) of the various popular (and not so popular) exercise trends being offered today. Because there is so much to cover, I thought it would be best to tackle exercises—in the form of classes or individual efforts—one at time. This way I have enough room to go over the basics, such as what it is, and how it works, and also provide feedback on concerns such risk of injury, weight loss maximization, best strength building methods, or which exercises are best for flexibility. Does your exercise make the grade? Find out what Dr. Sara Gottfried thinks as she grades different forms of exercise for women. In order to help women choose, I’ve decided to include a section that matches personality types (for example the “free spirit” vs. the “Type A”) with the exercise type (for example yoga vs. CrossFit). By no means is this strict criterion that you must abide by (yes, I’m talking to you, Type A’s), but can instead be a guide to help you in your own exploration, based on your fitness and health goals. 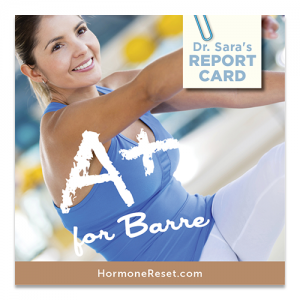 I thought I would start this first series of “exercise grades” with an exercise trend that has turned females into fanatics (and which also happens to be one of my favorites): barre fitness. If you’ve read my blog entitled Ballerina in Sticky Socks: Why I Recommend Barre Fitness, you will know that I have become a true barre-liever. This total body workout focuses on simultaneously lengthening and strengthening muscles, while providing a high intensity (but low impact) workout has served many of my fitness needs to strengthen (without bulking), build cardiovascular endurance, improve posture and lose weight. But I am getting a little ahead of myself. Let me get back to the basics. While there have been several variations on the theme (The Dailey Method, Purre Bar, Physique 57, Barre Fitness 3, and Barre Fitness Fusion) the general idea is the same; that is to draw on the knowledge of physical therapists and the modalities of dance to lengthen and strengthen muscles in a low impact manner that maximizes muscle endurance and strength while minimizing injury. Exercises are placed in a specific order alternating between the front and back sides of the body which aim to elongate one side while strengthening the other – improving posture and alignment to boot! Once the body is warmed up, the intensity is increased to optimize aerobic and fat burning capacity, followed by floor work to cool down while focusing on core strengthening. The good news is: barre fitness, and exercise in general, can help to reverse all of this. The lengthening and strengthening of your body helps to build your core muscles, improve your posture and increase your flexibility, thereby reducing tightness and risk for injury. The thousands of squats, lunges, leg extensions and bouncing raises your heart rate and improves your cardiovascular capacity which, decreases your risk of heart disease and delivers more oxygen to your brain and muscles so you feel alert, productive and energetic. Barre fitness also increases your metabolism, which helps burn calories and lose weight, all of which helps with decreasing your risk of obesity and diabetes. [iii] Need I say more? While almost perfect, there is something you should know about barre fitness. If you are a barre veteran, you probably know this already but for you barre babes just starting out, shaky leg syndrome is normal. Many newbies who first begin barre fitness are surprised (and often alarmed) to find their legs shaking uncontrollably as they perform their fiftieth plié. While potentially embarrassing, there is a very good explanation for why your legs tremble so ferociously and moreover, it’s a good thing. Muscle trembling is essentially muscle fatigue. When a muscle is contracted for long periods of time, it begins to tire. You’ve heard personal trainers and coaches scream “feel the muscle burn!”? That burning is the beginning of muscle fatigue. Muscle fatigue occurs after you power through that burn and your muscle can no longer fight the plié. Barre is one of my favorite forms of movement for women. The benefits far outweigh the drawbacks which, from my point of view, are limited to trembling legs and… well, OK, if I have to make one up-feeling pressured to wear those cute Lululemon pants that make your seat look nice (twisted my arm on that one!). I’ve gone to many styles of barre classes over the years, and some are wiser than others at when to use a neutral spine versus a tucked pelvis, but I trust that you’ll find the teachers that make your low back feel best. Perhaps best of all, barre is suitable for all personality types. This is the closest to “one size fits all” as far as I’m concerned. For the bendy yoga types, barre fitness offers lengthening and stability, for the power lifter types, barre fitness offers strengthening and for those Type A’s that never feel satisfied unless they are crawling out the door at the end of a workout, barre fitness offers high intensity too with its hoards of bending, plié-ing, bouncing and pulsing. While nothing is perfect, + fitness certainly comes close. Join the hoards and become a barre-liever too! To learn more about my 21-day plan to reset your hormones and get lean, go to hormonereset.com. “Our Story”, The Bar Method. [ii] Timo A Lakka et al., “Sedentary Lifestyle, Poor Cardiorespiratory Fitness, and The Metabolic Syndrome.” Medicine and Science in Sports and Exercise 35 (2003): 1279-86. [iii] Paul D. Thompson et al. “Exercise and Physical Activity in the Prevention and Treatment of Atherosclerotic Cardiovascular Disease.” American Heart Association 107 (2003): 3109-3116. [iv] Axel J. Knicker et al., “Interactive Processes Link the Multiple Symptoms of Fatigue in Sport Competition”. Sports Medicine 41 (2011): 307-328. [v] S. C. Gandevia, “Spinal and Supraspinal Factors in Human Muscle Fatigue”. American Physiology Society; Physiological Reviews 81 (2001): 1725-1789. [vi] Jan Praetorius Clausen, “Effect of Physical Training on Cardiovascular Adjustments to exercise in Man”. American Physiology Society; Physiological Reviews 57 (1977): 779-815.